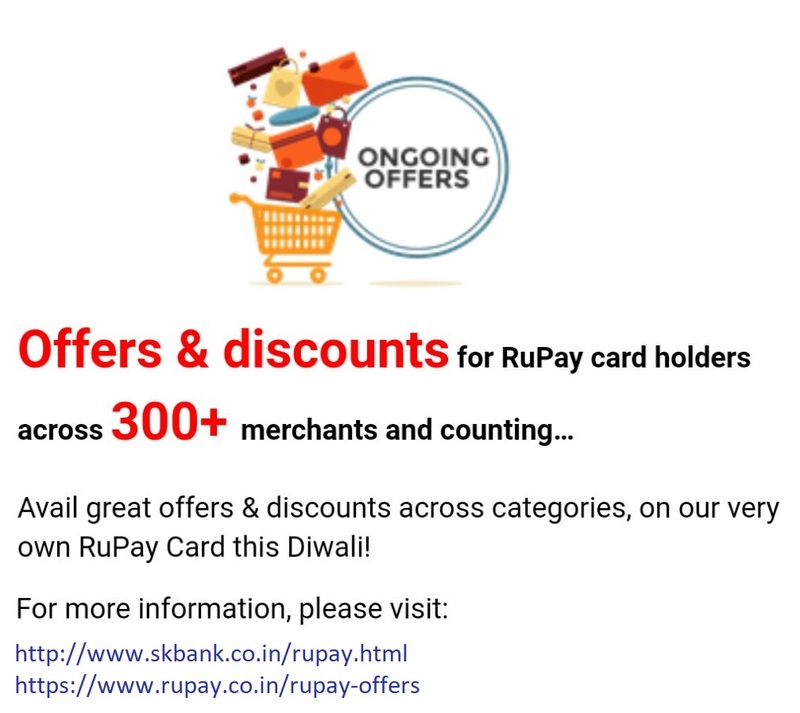 1 Rupay Diwali Offer Rupay Card Offer All our RuPay Debit, Platinum & KCC Card users (all RuPay variants) who make use of RuPay Card for Purchase or Spend Rs 2000/- & above anywhere, across product categories during the contest period for the month will be eligble to automatically get enrolled for this contest. The cashback amount will be credited to the customer’s account by 31st December 2018.
a. Tax liability, if any, to be borne by the Cardholder. b. Contest Offer valid across selective fare types and fare products transaction. d.	Regular Debit Card Terms and Conditions apply. Saco Bank reserves the right to alter any of the terms and conditions of the offer or to withdraw the offer completely at any time without prior notice. e.	The offers are subject to force majeure events. f.	The participation in the contest shall constitute deemed acceptance by the Cardholder of all the terms and conditions governing the Contest. g.	Saco Bank does not warrant, represent or guarantee the quality of goods / services availed by the customers. i.	Saco Bank reserves the right to disqualify any customers from the benefits of this offer inter alia for events like unusual transaction pattern or collusion between merchant and cardholder or any cases of charge back and refund. j. The Bank at its sole discretion can decide cardholders who can avail these offers. The decision of Saco Bank will be considered as final and binding for rewarding the customers/employees. k.	In all matters relating to the Contest, the decision of Saco Bank shall be final and binding in all respects. l.	The Bank reserves the right at any time without prior notice to add, alter, modify, all or any of these terms and conditions or replace, wholly or in part, this Offer by any other Offer, whether similar to this offer or to withdraw it altogether without giving prior notice. m.	The terms and conditions of the programme shall be in addition to and not in substitution/derogation to the primary terms and conditions governing the card and shall at all times be read along with terms of the Card member Agreement and such other terms and conditions that the Bank may deem appropriate in its sole discretion. Any irreconcilable contradiction between the terms and conditions contained herein and the Card member Agreement, then terms of the Card member Agreement to prevail the present conditions. b. The offer is valid for a period of 12 months. c. The offer is valid on dine-in and not on delivery and take away. d. The offer is valid only on A la carte dining..
e. The above offer is passed on to the customer seamlessly by the staff provided the RuPay Cardholder pays by his/her RuPay Card and asks about the discount. f. The above offer will be applicable only if the customers pays the final bill with a RuPay Card . f. The above offer will be applicable only if the customers pays the final bill with a RuPay Card. .
Click Here to Get More Information about Rupay Card. 02, November - 2018 09:16:50.